2. In the bowl of a stand mixer fitted with the paddle attachment or in a large bowl with an electric mixer, beat the butter and 1/2 cup of the confectioners' sugar until smooth and creamy. Add in vanilla extract and mix until combined. 3. Mix in the flour, pecans and salt. Mixing until just combined. 4. Roll about 1 tablespoon of dough (mine are a bit larger, see notes below) into balls and place on prepared baking sheet. The cookies can be placed quite close together since they do not spread during the baking process. 5. 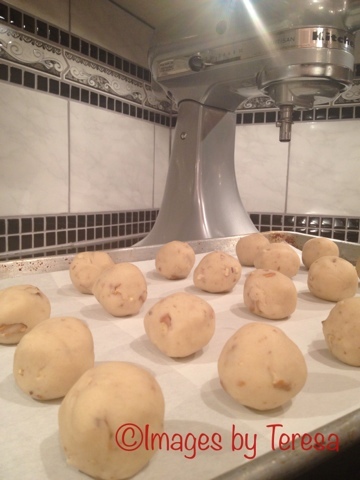 Bake in preheated oven for about 15 minutes – taking care not to over bake. Allow cookies to cool on baking pan until you are able to comfortably hold them in your hands. 6. Sift 1/3 cup confectioners’ sugar into a medium bowl. 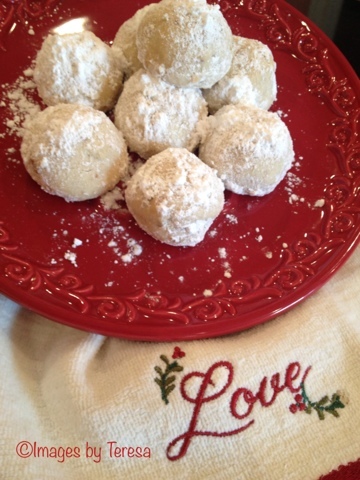 While cookies are still warm, roll them in confectioners' sugar. 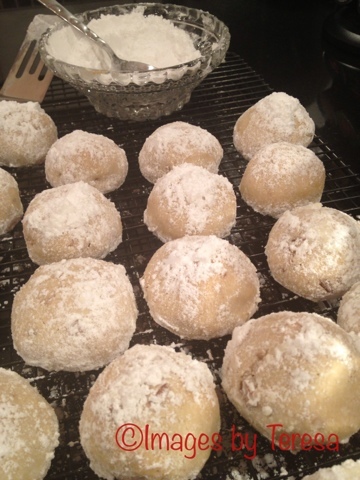 Place cookies on cooling rack, once they have cooled completely, roll them in confectioners' sugar again. These rich little cookies are extra-special when made with macadamia nuts. If salted butter is all you have on hand then omit the salt. Make it your way. Toasted Coconut Tea Cakes are a special treat for coconut lovers. Toast 3/4 cup coconut by baking uncovered in an ungreased shallow pan at 350°F for 5 to 7 minutes, stirring occasionally, until golden brown. Let coconut cool before adding to the dough. 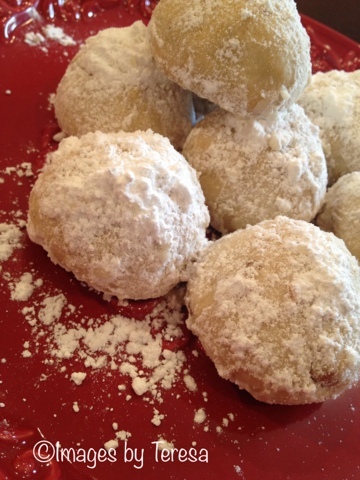 The 1979 Betty Crocker cookbook has a version called "Ambrosia Balls" - Follow the Russian Tea Cake recipe except swap out the nuts for 1 cup flaked coconut and add in 1 tablespoon of grated orange peel. So Yummy! Really Mom, You have to take a picture before we can eat them?! Ok...so now you're playing "Betty Homemaker"! Of course you have to have a picture before you eat it! Great photos! A cross between Paula Dean and Miss Martha S...... I promised ramblings!!!! Thanks for being my number one supporter and encourager!